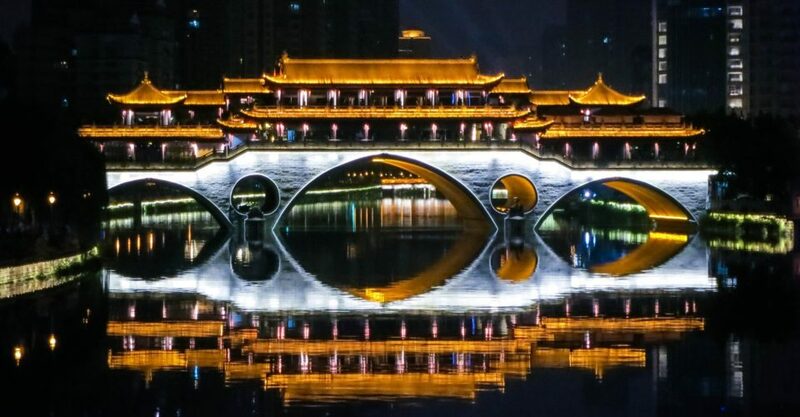 Chengdu is known as a business center and Giant Panda haven, but the historic city is experiencing a travel renaissance thanks to its historic cultural sites, tea culture and fiery food. A hungry resident of the Chengdu Research Base for Giant Panda Breeding. There’s no better place to see the city’s famous cuddly residents than the Chengdu Research Base for Giant Panda Breeding. Sprawled over 106 hectares and home to endangered species like red pandas and golden monkeys, the base also houses more than 80% of the world’s giant panda population, as well as research labs and the Giant Panda Museum. 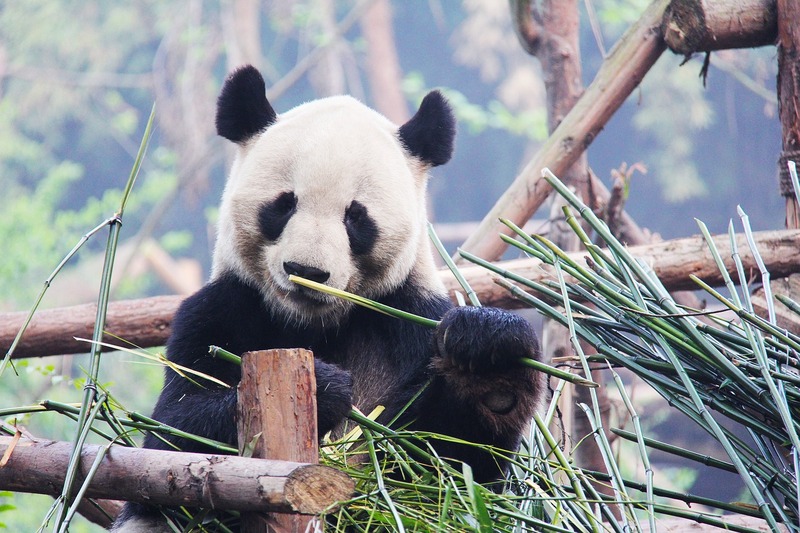 Although smaller, the Dujiangyan Panda Base hosts a volunteer program that lets you spend a day looking after pandas. Teahouses are the social staple of Chengdu so for a truly local experience, head to one of the city’s thousands of teahouses and rub shoulders with locals shooting the breeze over China’s biggest export. Try Sanhua Pagota, an outdoor teahouse located by the river at Baihuatan Park; or enjoy some Sichuan Opera with your tea at Shunxing. With some 1,800 years of history, Jinli Street is one of the oldest commercial streets in the city. Just 350 meters long, the ancient street is jam-packed with teahouses, inns, restaurants, bars, theatres, snack vendors and specialty shops, and is a great place to find local crafts to take home like Shu embroidery, lacquerware, calligraphy, shadow puppets and paper cuttings. A Chinese opera performer in Chengdu. Colorful, musical, comedic and acrobatic, the Sichuan Opera is something that must be experienced to be believed. 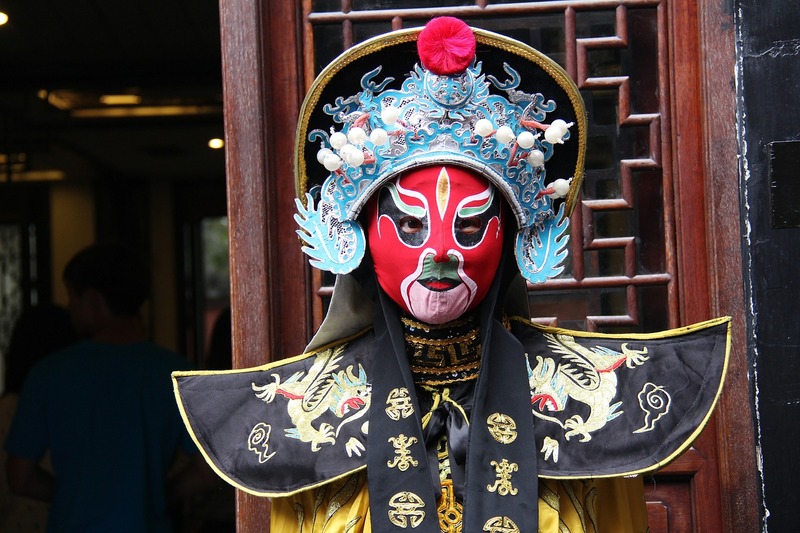 Treat yourself to the Shufengyayun Opera House or the Sichuan Opera Theatre for a visual and aural feast of intricate face masks, detailed costumes, live Chinese instruments, and fire and puppet shows. Temples abound in Chengdu, but Wenshu Monastery is one of China’s most significant Buddhist centers and boasts a history of some 1,400 years. There are plenty of historic paintings and calligraphy works around, and the gardens – filled with koi ponds, pagodas and sculpted rocks – are a tranquil retreat. The Wuhou Temple –sometimes called the Martial Marquis Memorial Temple – is also worth a look. Restored by the government, the Wide and Narrow Alleys is a historic district paying tribute to the city’s forgotten imperial-era architecture and China’s modern commercialism. You’ll find plenty of shops peddling trinkets, but Fingertip Art is worth a look for brightly embroidered bags, shawls and pillows. Known as Little Lhasa, Chengdu’s Tibetan quarter is a colorful experience filled with vendors selling yak butter, shops selling religious icons, prayer flags and wheels, and Tibetan-style crafts like patterned leather boots. Once a hole-in-the-wall, Chen’s Mapo Tofu exploded when locals and visitors discovered the rich exquisiteness of its namesake dish, silky tofu laced with red chili and ground pork. The government may have bought it out and turned it into a franchise, but the dishes at the original outlet will still thrill. Hotpots are the quintessential Chengdu dining experience, and Lao Ma Tou is one of the city’s favourites. Join the noisy, convivial crowds dunking meats, balled seafood and leafy greens in boiling pots of spicy broth – there’s a toned-down version for those who can’t handle the heat. You’ll need to book two days in advance and walk through a darkened courtyard before you get to feast on Zi Fi’s innovative take on Sichuan cuisine. In private dining rooms, the chefs treat you to a surprise succession of fiery and cooling dishes, so you might find yourself chasing turtle with coconut milk or pork with green-bean juice. Amidst regal décor inspired by the ancient Shu civilization, Li Xuan, at the Ritz-Carlton, offers a sophisticated take on traditional Sichuan and Cantonese dishes. Duck in for the all-you-can-eat weekend dim sum brunch and sample local favorites like the mapo doufu, lazi ji (fried chicken with chilies) and dan dan mien noodles. Another local favorite, Shizilou is the city’s biggest hotpot restaurant, and specializes in the old-fashioned Yuanyang style. 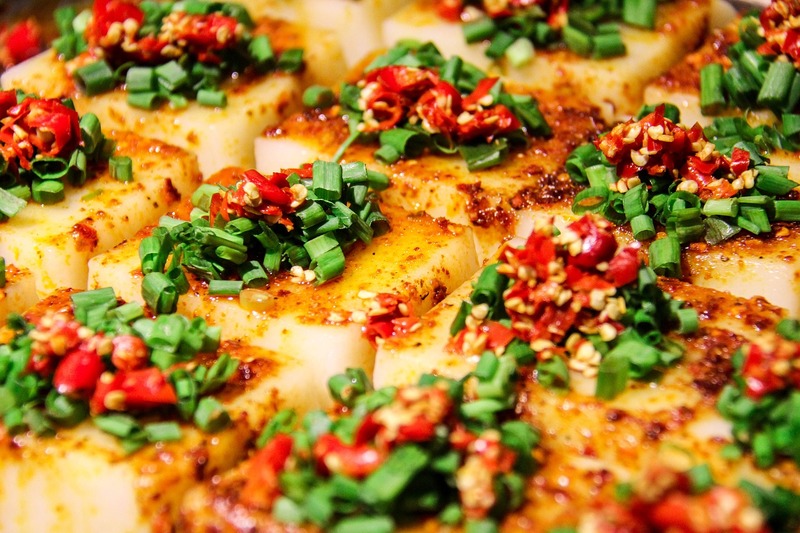 Established in 1995, Piaoxue puts its own stamp on Sichuan’s spicy cuisine. Stop in to try the pickled hot chili Mandarin fish and garlic ribs. 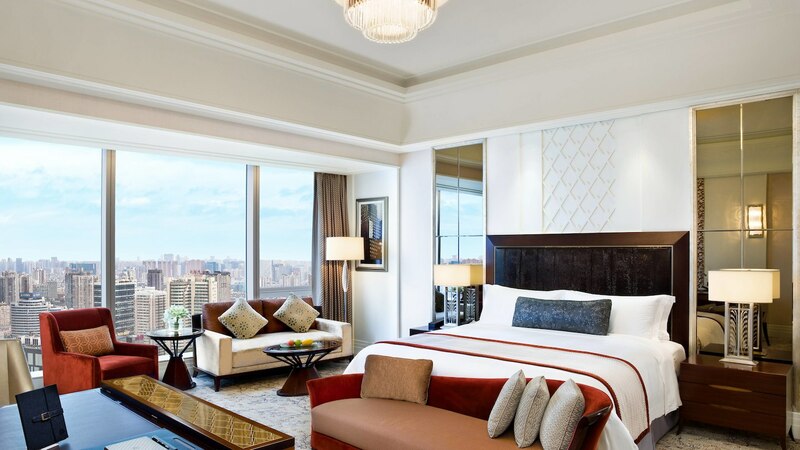 A guest room at the St Regis Chengdu. Like most major cities Chengdu is home to plenty of hotels catering to all range and budgets. The Sheraton, InterContinental, Sofitel and Shangri-La are all safe bets, but for a really luxe experience check into the St Regis. The Ritz-Carlton, the Kempinski and the recently-opened Temple House also offer special panda packages. Dragonair, Sichuan Airlines, Air China, and Hong Kong Airlines all fly direct between Hong Kong and Chengdu several times each day. Chengdu’s subway system is still growing but it’ll get you to most places in the city. Taxis are cheap and plentiful, if you can speak the lingo.